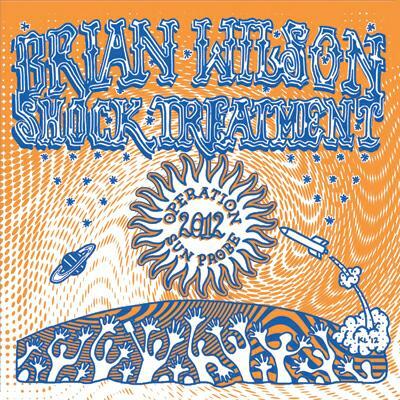 New York City based Brian Wilson Shock Treatment (BWST) have been cranking out raucous psychedelic garage rock for nearly a decade now. Operation Sun Probe is their latest and for this outing the band consists of Brian X. Rose on bass, guitar and vocals, Mr. StarryNight (aka Scott Prato) on lead guitar, analog synth and vocals, Mark McClemens on drums, and Bonnie Kane on sax, flute and electronics. Aural Innovations review followers will recall the Big Plastic Finger review I posted yesterday. Well note that Scott, Bonnie and Mark are in both bands. A talented and creative bunch indeed. As the band name suggests, these guys are heavily influenced by the psychedelic 60s. The album opens with the space rocking Colossal Atomic Man, singing of the guy who due to having the misfortune of being in a town that suffers a nuclear plant meltdown grows to 60 feet tall. It’s a Frankenstein meets Iron Man tale, and my favorite lyrics are, “His sister came out to save his soul, but he freaked out and the tanks they rolled.” Other highlights include Legeia, which is a spaced out garage psych rocker, singing of the mermaid who lies in wait to seduce passing sailors. It rocks hard but as if to communicate that seductive feel, there’s a laid back segment, with flute and acidic, melodic guitar lines. Cell Phone Radiation Blues features psychedelic rock n’ rolling Blues, and I really dig the last couple minutes as the band take off on a spaced out rocking jam. The Flood sounds like a 60s pop song with an injection of edgy psych rock. And I Walk In Shadows has a prog-psychedelic anthem feel. The Circle Is A Square takes things in a different direction, being a space-prog instrumental with synths that sound like a John Carpenter movie soundtrack, along with ominous guitar and a beautiful flute melody. A cool, schizophrenic mixture of foreboding and uplifting sensations. The title track is similar and goes into deep space. This would make the perfect soundtrack to a sci-fi TV show and brings back memories of the old Thunderbirds series or something like that. Actually it reminds me of Alan Davey’s Chaos Delight album. The album also includes two cover songs. If It’s Tuesday, This Must Be Belgium was a song written by Donovan as the theme to the 1969 movie of the same name, and sung by someone named J.P. Rags. I had to Google a bit to get the scoop as I’d never heard this song, and also found a YouTube video of Donovan appearing in the film singing a different song. Anyway, BWST maintain the peaceful folky feel of the original, while sneaking in some lightly grungy guitars, tasty warbling guitar solos, and a lovely flute melody. Swinging 360 degrees in the other direction, the band cover Black Flag’s Nervous Breakdown, demonstrating what a short stretch it is from Black Flag’s brand of punk to BWST’s speedy, ripping psychedelic take on the tune. Operation Sun Probe is available in vinyl LP and digital download formats (buy the LP from the BWST Bandcamp site and you get the download too). Note that the download includes two additional songs not on the LP. In summary, Operation Sun Probe is a fun set of smoldering punky psychedelic garage rock, songs with a 60s vibe that would be at home on a Nuggets compilation, and much more.